Take science out of the classroom and into your home by helping your children create a mini garden as a weekend project or after school activity. Kids can learn about natural processes such as evaporation, condensation and precipitation while getting their hands dirty making a project that they can watch grow in their bedroom windowsill for years to come. A terrarium is a collection of small plants that grows in a sealed container. A terrarium is comparable to an aquarium, except it’s not for fish, it’s for plants. What supplies do I need to make a terrarium? How do I build a terrarium? Wash and dry the terrarium container. Place a layer (approximately 1 inch) of small stones or pebbles in the bottom of the terrarium to assist with drainage. Lay a thin layer (approximately ½ inch) of activated charcoal over the stones. The charcoal prevents the growth of bacteria and mold. Put a layer of sphagnum moss on the activated charcoal to prevent the soil from settling. Place a layer of potting soil (approximately 2 inches) on top of the moss. The amount of soil will vary by container. Ensure there is enough room for plant roots to grow. Bury plant roots in the soil. Add decorations to the terrarium. Mist the soil and the sides of the terrarium container with water (approximately ten sprays). Close the terrarium container tightly with a lid or cover. Is a terrarium expensive to make? To cut down on costs, use leftover food containers for your terrarium. Look around your yard or neighborhood for small stones and plants. Get creative and make terrarium decorations from objects that you find around the house. How do I take care of a terrarium? Place your terrarium in an area with indirect sunlight. 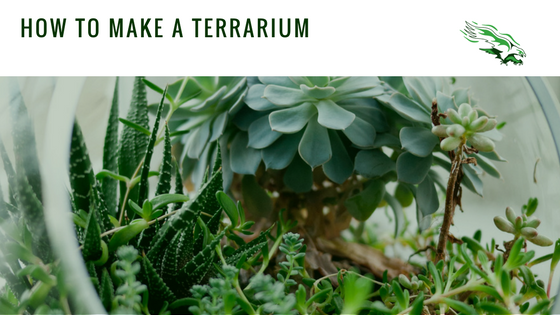 A terrarium can go weeks without watering- even months. A sealed terrarium is self-nourishing, requiring little maintenance. The water in the terrarium passes from liquid to gas and back to liquid. As the moisture in the air condenses on the walls of the terrarium, it returns to the soil and is absorbed by the plants. If the plants get too big for the container, trim them with scissors. How do I know that my terrarium is doing well? A sign that your terrarium contains the right amount of water is if the sides and tops are misty with water droplets. If there isn’t any moisture present on the sides of the container, then you need to add more water to your terrarium. If it’s difficult to see the plants because the sides of the container are too wet, then you should remove the top and let some of the excess water evaporate. What can a child learn from a terrarium? A terrarium can be used to show how an ecosystem works. Inside a terrarium, natural processes like photosynthesis and the water cycle can be observed. A terrarium is a learning opportunity for the whole family. It’s an educational tool for all ages that also adds a little bit of outdoor beauty to an indoor space.